Or was it the other way round, and was there a decision first? Hanny and I had indeed decided early in 2007 to have a go at another stay-with-a-purpose in a developing country. Another one, as I had long ago already worked for two years as a secondary school teacher in Kenya. One year in a small village close to, and the other in, Kenya’s then 5th-in-size city Nakuru. Both were then very peaceful areas; recently they witnessed terrible events following the contested elections. Going on our own seemed like a worse option than going in the context of an organization. We considered two of these. The Dutch PUM sends off retired managers for particular missions of a few weeks/months to provide requested support in their areas of expertise. And VSO, formerly Voluntary Services Overseas, still implements its mission ‘Sharing skills, changing lives’ by searching for individuals with specific skills matching requests that are made in the context of its programs in developing countries. So I enlisted for both. Hanny preferred not to look for her own volunteer position. The placement just had to be somewhere that made it likely for her to develop activities independently too. VSO (after first having gone through an assessment process with both of us) made the offer late in August 2007. Hanny had frankly set her hopes on Cambodia – we both like Southeast Asia a great deal. 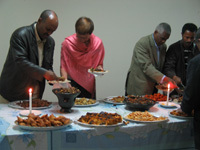 But the Ethiopian offer also pleased us much. My task description seemed somewhat too broad, from low level day-to-day IT tasks up to computer network and IT development planning. That was good for at least two jobs, and not necessarily matching my skills fully at the technical hands-on level. But that did not seem to stand in the way of mutual agreement early October about the placement. And the location is one of Ethiopia’s finest. It is a bit on the warm side, and reportedly with malaria still around, but also with friendly people and beautiful scenery. VSO arranged two long weekends of training in De Kleine Aarde in Boxtel, for groups of about 10 Dutch volunteers. One for both Hanny and me: Preparing to Volunteer, a mix of extensive info of the history of international co-operation efforts, role plays in practical situations, HIV/AIDS and gender information provision, with video material about eg labour and after-labour conditions for South-African miners, and interviews with returned HIV-positive volunteers. The other training only for me: methods of facilitation, role plays in more complicated cross-cultural encounters, tools to use (SWOT revisited) etc. On our own account we also contacted an Ethiopian gentleman presenting himself on the Internet for a range of services related to the Amharic language. He had devised teaching materials specifically for the Dutch and in the Dutch language (as he masters that himself too), and was prepared to give home lessons. We took some in preparation, although we would also start with 8 blocks of two hours Amharic tuition in Addis Ababa. In the preparations for our long-term absence, Hanny took the project lead. As there are: preparing the house for renting out (we are currently hesitating between four Russian scientists and a British couple with three lively young children); organizing the change of subscriptions, insurances, finance, medical issues, long term storage, making the packing lists, purchasing the necessary stuff and so on. And meanwhile: countdown. Towards ‘retirement’ – though it just did not feel like that, much more like a change of jobs. From a safe haven and known activities with much acknowledgement and appreciation to a challenging but potentially not easily doable assignment. And then we went, on 29 Jan. Brechtje and Friso took us to Schiphol. That was the hardest part – not seeing them regularly anymore as we did until now. Maartje and Arjen already live several years in the US; but with them the very frequent phone calls will at least initially also become less frequent. The Addis climate is pleasant, though the rapid transition between sometimes outright cold mornings and evenings and warm mid-days with strong sun takes some getting-used-to. If there is little wind, there is much pollution, with diesel trucks, buses and cars belching ugly clouds of black, grey or white smoke. 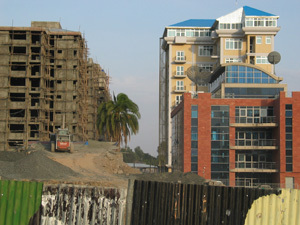 The city is in the middle of rapid growth. Though much of it consists still of low houses in clay, stone or corrugated iron, new multi-storey buildings in concrete and glass are springing up everywhere. 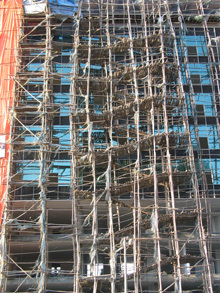 Scaffolding in metal seems to be scarce, and there are very elaborate scaffolding constructions made of wood, even for buildings over 10 floors. The one-star hotel that VSO arranged us to stay in (34 new volunteers this batch) during the in-country training was fine. Very clean, hot water, bridging the incidental power cut with candles that you can also take away in a bottle so as to find your way on the stairs. A training of 10 consecutive days for all of us was held in rented accommodation of a training centre, followed immediately for most volunteers by a two-day specialized workshop with a number of existing volunteers in their program. The main training was a combination of Amharic lessons, a bit less efficient than those we had at home, and presentations by guest speakers about economic, social and cultural aspects of Ethiopia. One afternoon was free for shopping: to buy those things you cannot find in your remote placement and have not brought with you. On the last day of the formal training, representatives of our partner organizations had been invited, and were largely present. In moderated sessions, we explored each other’s expectations – but of course mainly got to know each other personally in the breaks. And in the ICT volunteer workshop there were very useful feedback sessions to VSO and newcomers of existing volunteers, as well as technical exchanges. As Internet capacity is a problem in Ethiopia, I had been asked by one of the volunteers to download and bring a bundle of Open Source material, to which I had added my own collection of downloaded manuals for the systems and equipment that was reportedly in place in my destination, Arba Minch University (AMU). Others brought in further material and several Gigabytes of e-books, information and public domain products were thus generally distributed. There were some presentations about achievements and hindering factors for specific IT volunteer projects; and useful tips for how best have your institution cope with the abhorrent Internet response times. One measure that I found out myself already had been: upload a few pictures to my website on a Sunday night, especially Sunday nights with important football matches on TV; notably the Africa Cup (finished, unfortunately; Egypt won) or matches of Manchester United. And then only at a place where there is nominally a ‘broadband’ connection (as any leased line from 128 Kbps onwards is called) – not in one of the Internet café’s that seem to be selling waiting time mostly. The latter are OK however for some normal mailing or updating the blog at http://hannyenhans.waarbenjij.nu from a flash drive. 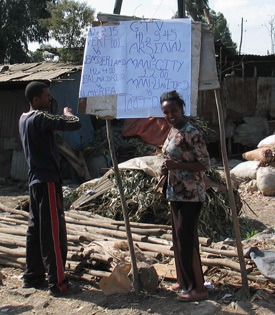 Meanwhile it was of course great fun to discover Addis. Part of the training was a scavenger hunt in the evening: go out and arrange on minimal budget to find a certain coffee-house several kilometers away, use local transport not taxi’s, purchase specified goods, ask for specifics and record answers, make a local phone call to confirm where you are (not from a mobile), and so on. It was also wonderful to get to know so many like-minded people from all over the world: this batch had volunteers from UK, Canada, NL, Australia, Philippines, Uganda and Kenya. The UK facilitators of the training had also prepared a good old English quiz night. And as we had come a few days before all other volunteers, and will leave four days after the last training day, there was lots of time to walk around in town, take part in what it has to offer, and do a few museums meanwhile. 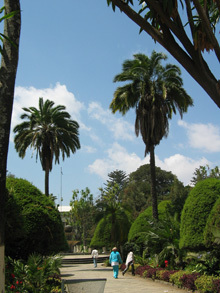 Like the M of Ethnography, in Haile Selassie’s former palace in the beautiful gardens surrounding it, now home to Addis Abeba University Campus. That, my dear Watson, we will know next week. In two days’ time we will fly away from the metropolis Addis Ababa, and target an airfield half a thousand kilometers to the southwest, deep into the Rift Valley, almost in-between the two magnificent lakes Chamo and Abaya . There, a vehicle from Arba Minch University will be waiting to take us to… our house-to-be? To a hotel? And the following week will take me to what it is that I can or cannot contribute to the prospering of a 4-year-old university of meanwhile close to 8 000 students from all over Ethiopia.